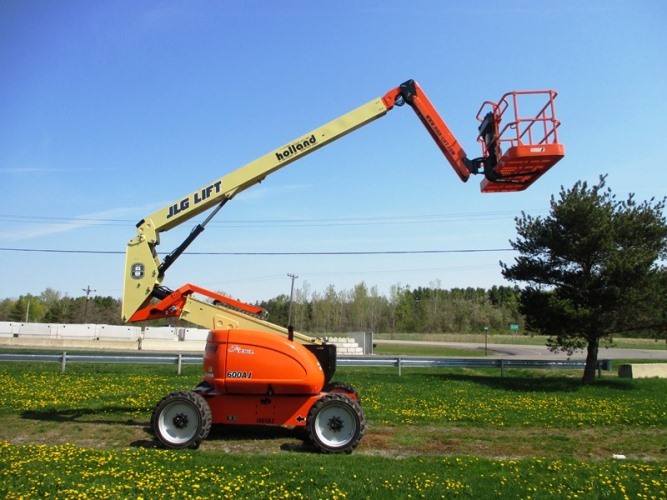 Benefits – Capable of reaching heights of up to 150 ft. Articulated boom lifts achieve their maximum heights by a combination of two lifting boom sections as well as a telescoping portion. By raising the lower boom section, often called the riser, a worker may be able to work close to a building. An example would be working over a porch. By raising the lower boom one could drive directly up to the porch and work on the higher areas of the building. Articulated booms often have no tail swing meaning the lift rotates in it’s own radius eliminating many problems related to poor views of the rear of the lift from the basket. Other articulated lifts have no protruding tail when the lower boom section is raised. Much of the time this has the same effect of true no tail swing models. Liabilities – Articulated booms by design have more moving parts and therefore the possibility of more failure points and maintenance. Overall horizontal reach of articulated booms of similar size is less than telescopic booms. Smaller articulated booms are not available with 8 foot baskets. 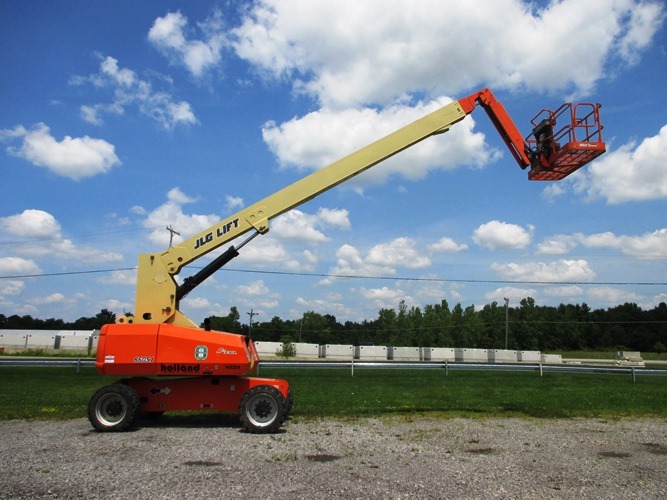 Advantages – Capable of reaching heights of up to 120 feet. Rugged design. Higher maximum horizontal reach when compared to an articulated boom. Less moving parts then articulated models. Liabilities – No tail swing models generally not available. At times more difficult to use in confined spaces.